By Willard C. Matthias. University Park, PA: The Pennsylvania State University Press, 2001. 367 pages, footnotes, index. When reading about Matthias’s professional background one indeed expects the perfect combination of scholarly research and insider’s experience, derived from a short academic spell in the Government Department of the University of Miami, coupled with WWII experience in “Ultra” decrypting, and over two decades’ work with the Board of National Estimates (1950-73*) of the Central Intelligence Agency. This volume was therefore not intended simply as personal memoirs but also as freelance research into previously classified archives—the author quotes several of his articles and reports published since he left the CIA—supplemented with presidents’ and state secretaries’ memoirs, the Woodrow Wilson Center’s Bulletin of the Cold War International History Project series, and a brief selection of secondary publications. 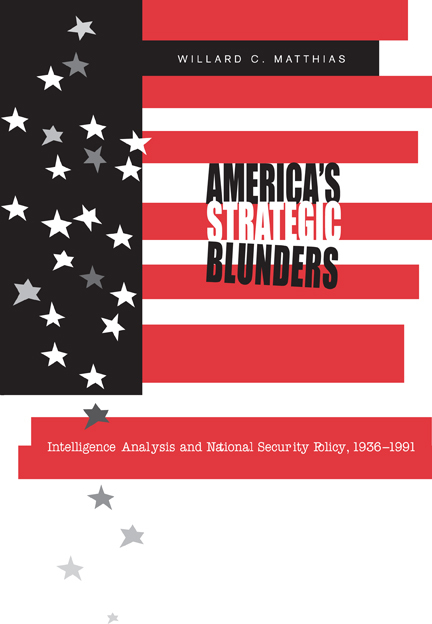 While one can regret the deliberate disregard for reference works by landmark historians of the Cold War period (there is no general bibliography, and footnotes solely elucidate quotations), the detailed account of the security apparatus’ operational machinery and frequent at length quoting from declassified Intelligence Estimates and Memoranda nevertheless make the book an exceptionally valuable source for prospective in-depth analysis by diplomatic historians. Recent secondary literature on the USSR similarly proved beneficial in providing Matthias with first-hand material from Soviet archives. This partial (i.e. incomplete and biased) use of archival material—CIA documents other than Intelligence Estimates available in presidential libraries or in the Foreign..